Opened in 1993, the Pennsylvania Convention Center is the hub of convention activity in the city. The Center has 440,000 square feet of exhibit hall space and 33,000 of ballroom space included in over 610,000 square feet of functional space. The Convention Center has a unique design, connecting to the old Reading Terminal Headhouse which served as a passenger station and company headquarters for the Reading Railroad. The Headhouse was designed in 1891. The center is also connected indoors to a Hard Rock Cafe, the Reading Terminal Market, Kinko’s and the Philadelphia Marriott Hotel. 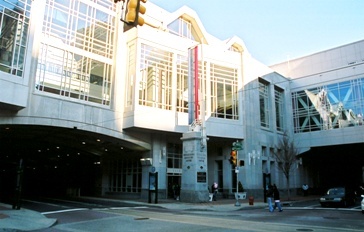 The Convention Center is located at 12th & Arch Streets. Convention Center Website.